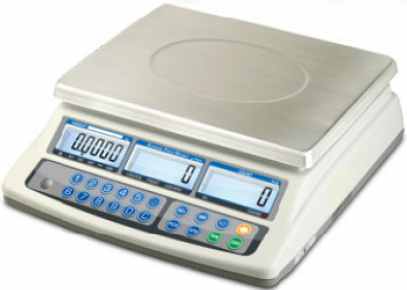 Counting scale, particularly suitable for taking inventories and counting small parts. Weight or piece quantity check, weight and pieces' totalisation, 10 PLU memory. Available also CE-M APPROVED for legal for trade use. 3 backlit LCD displays with 6 digits 20mm high, for viewing the weight, average piece weight, and number of pieces. Membrane waterproof, numerical and functional keypad with 20 keys and acoustic feedback. Stainless steel plate, 230x300mm size. Built-in rechargeable battery (about 70h battery life) and 230V power adapter. Packaging: 410x375x180mm size - approximate weight of 5,1kg. - 3000e + 3000e dual range CE-M approval.